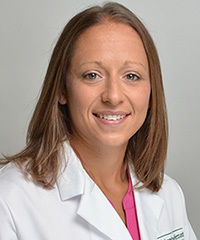 Alison M. Migonis, DPM earned her medical degree at Des Moines University and completed her internship and residency at Beth Israel Deaconess Medical Center, in Boston, MA, a teaching hospital of Harvard Medical School. Migonis’ path to podiatry was heavily influenced during her senior year at Le Moyne College. She and her family also wanted that kind of contentment and satisfaction in their leisure time. Central Vermont seemed the perfect fit and time here will include time in the water. “I’ve been swimming all my life,” Migonis said. “I loved being able to compete (at Le Moyne).” Her track record clearly demonstrates this fact. She’s the only individual national champion in the college’s history and the first student athlete from the swimming and diving teams to be inducted into its Hall of Fame. She set a school record in the 200-yard butterfly in 2008 and earned the most awards in the swimming program’s history. She’s a five-time All-American and earned gold at the 2008 NCAA championships. She was named Conference Women’s Athlete of the Year for swimming in the 2006-07 season. She won 10 conference championships in the Northeast-10 Conference, received the Presidential Scholar Award all four years at Le Moyne and made the Dean’s list all eight semesters.